Warrior was the brainchild of Admiral Baldwin Walker and was designed by Isaac Watts, the Navy's chief constructor. The idea was for a ship that would have unbeatable speed, unmatched firepower and impenetrable protection. Warrior boasted steam powered engines and 48,400 square feet of sale. Warrior was equipped with a propeller that could be disengaged and lifted out of the water to stop it dragging when Warrior was under sail power. She was also fitted with telescopic funnels that could be lowered to allow the sails to capture the wind. Warrior used 68 pounder guns and bigger on one long deck which technically made her a frigate but was 120feet longer than any previous warship ever built. The guns were protected by an armoured box or citadel which was built of 11cm wrought iron plate which was bolted on to 46cm of teak which in turn was attached to the ships 1.6cm hull. In May 1859 the keel of Warrior was laid at the Thames Ironworks in London. In autumn the ship received the name Warrior. On 29th December 1860 Warrior was launched by the first Lord Sir John Pakington and by 1st August she was ready for her first commission. Warrior was 127metres long, had a beam of 18metres, weighed 9,210 tons and had a draught of 8 metres. She could reach speeds of 13 knots under sail and 14.5 knots under steam power. She boasted 26 muzzle loading 68 pounder guns and 10 breach loading 110 pounder guns and cost £390,000 to build. With the rapid evolution in warship design in the 1860s this meant that Warrior was overtaken by more advanced ships. By the 1870s steam engines had improved to the point where masts could be abandoned. In 1871 HMS Devastation was introduced and she was Britain’s first mastless battleship and this marked the end of Warriors career as a front line ship. For three and a half years she underwent a refit before undertaking her new naval and coastguard duties. This meant that most of her time was spent in port. On 14th May 1883 she entered Portsmouth for the last time under her own power. During her life she had sailed 90,000 miles. Her boilers, engines and guns were stripped and she was left in Fareham creek. In 1902 Warrior became a mother ship to Portsmouth's torpedo boats before in 1904 becoming part of HMS Vernon's torpedo training school. In 1923 Warrior was paid off and then she was offered for sale but nobody wanted her. In 1929 her hull was towed to Milford Haven to be used as a floating oil jetty at Pembroke Dock where she remained for 50 years. In 1976 word came that the fuel depot would close in two years and that Warrior would no longer be needed and it was then agreed that Warrior would be restored at an estimated cost of between £4 million and £8 million. The restoration work took place in Hartlepool where she was towed in 1979. 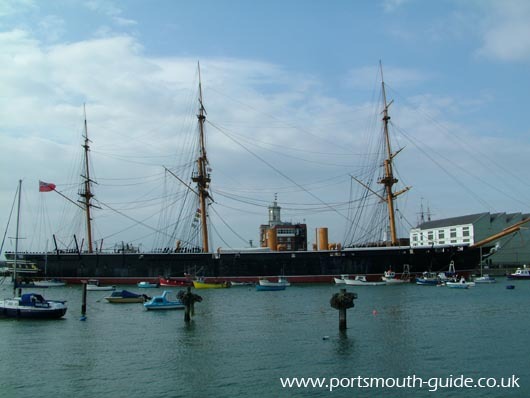 On 16th June 1987 she returned to Portsmouth to take her place at the entrance of Portsmouth’s Historic Dockyard, where she remains to this day. When the warrior was in commission she had a crew of 42 officers, 3 warrant officers, 455 seaman and boys, 33 Royal Marine officers, 6 Royal Marine NCOs, 118 Royal Marine artillerymen, 2 chief engineers, 10 engineers and 66 stokers and trimmers which gave a total of 705 men. When visiting Warrior you enter the Warrior on the upper deck, on this deck can be found the captain's bridge, hammock racks and telescopic funnels which could be lowered when the ship was under sail. The stern pivot gun which could fire 110 lb shots and the propeller well can also be found on the upper deck. Then climbing the stairs to the main deck leads to the births for 655 men and ratings. On this deck there are 26 muzzle loading guns which fire 68lbs and 8 breach loading guns firing 110lbs shot. The galley where all the food was prepared for all 705 crew can be found on this deck. The Capstans for raising the anchors can be found near the centre of this deck. Towards the stern (back) of the ship the captains day cabin, commander and Master (Navigator) cabins can be found. Going below to the lower deck the officers ward room and cells can be found on this level. On the bottom level of the ship, which is below the water line, is the engine rooms. In here there are ten boilers with four furnaces to power the ship when under steam. As can be seen from the above photo the Warrior is still in the water and is not in dry dock.